This member of the Rose family usually reaches a height of 50 to 80cm, and the flowers are typically 1.5 cm in diameter. It is pollinated mainly by bees but is attractive to a variety of insects. The stamens and pistils develop at different times, which prevents early self-pollination; however, as the flowers age the stamens eventually become elongated, enabling self pollination. The red seedheads (below) are as attractive as the flowers, and they persist through late summer and well into autumn. 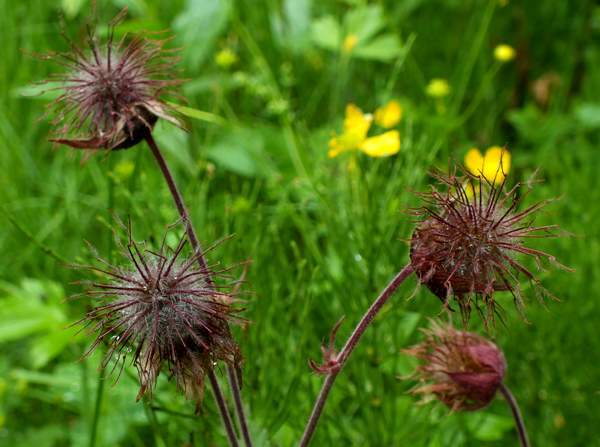 Found throughout Britain and Ireland, Water Avens has a wide geographical distribution in Europe, from Scandinavia to the Mediterranean region, and we found large numbers of them in the river valleys and meadows of the Triglav National Park in Slovenia. This plant is also found throughout most of North America, where it is recorded as being a native species. 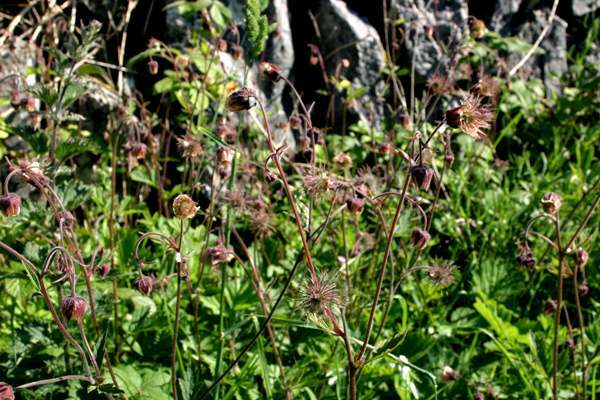 Water Avens are flowers of damp, shady places. They are often found beside streams and at the edges of hedge-lined fields bordered by ditches. Rather surprisingly, this wetland plant is also found on shaded rocky ledges in Snowdonia, in North Wales. The flowers, which can be seen from April until September, are usually at theirbest in June. 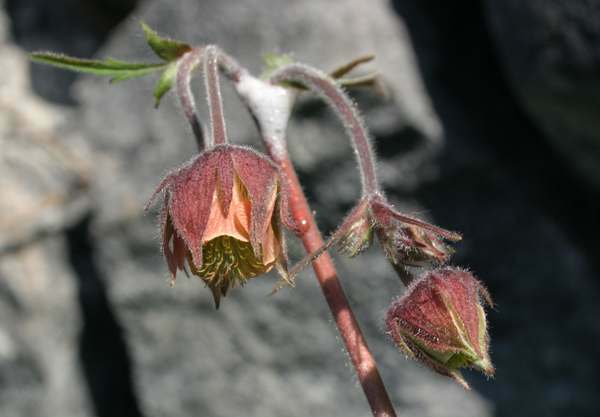 The burr-like seeds of Water Avens are distributed after beingcaught in the coats of rabbits and other furry animals. Geum, the genus name, comes from the Greek word geno, which means to give off a pleasant fragrance. When crushed, the roots of Geum plants smell like cloves. 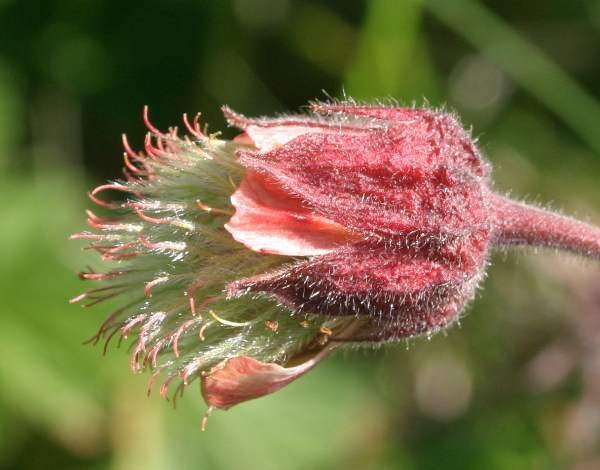 The specific epithet rivale means 'of or pertaining to a brook' - a reference to the kind of habitat in which Water Avens grows. Pictures shown on this page were taken in west Wales, in northern Italy, and in The Burren, County Clare, Ireland.